In typical cases of sudden infant death syndrome (SIDS), an infant between the ages of two to four months is found dead with no warning, frequently during a period of sleep. Because the typical victims are previously healthy infants with no record of any serious medical problems, their sudden death is all the more shocking and devastating. Some have said that this type of death is "a cosmic slap in the face" to parents, grandparents, other adults, and siblings who had previously delighted in the child's birth and growth, and plans for his or her future. Sudden infant death syndrome—called "SIDS" by many professionals, but also termed "crib death" in the United States or "cot death" in some other English-speaking countries—is "the sudden death of an infant under one year of age which remains unexplained after a thorough case investigation, including performance of a complete autopsy, examination of the death scene, and review of the clinical history" (Willinger, James, and Catz 1991, p. 681). Three aspects of this definition are worth noting. First, an accurate diagnosis of this syndrome requires a thorough investigation, including an autopsy (preferably performed by a medical examiner or forensic pathologist who is experienced in diagnosing infant deaths), along with a careful examination of the history and circumstances behind the death (including interviews of parents and others involved in the care of the infant, collection of items from the scene of death, and meticulous evaluation of all of the information obtained). Hasty or incomplete diagnoses can sometimes confuse SIDS with deaths resulting from child abuse or other causes. Such errors can compound burdens placed upon parents and other survivors of SIDS if they are wrongly accused of child abuse, just as they may cloak abusive situations under the more benign diagnosis of SIDS. • circumstantial facts such as a peak incidence of SIDS at two to four months of age, which declines to almost nonoccurrence beyond one year of age. Markers such as these, when identified by a competent, thorough, and experienced physician, justify recognizing SIDS as an official medical diagnosis of death. During most of the 1980s, SIDS accounted for the deaths of approximately 5,000 to 6,000 infants per year in the United States. From 1988 to 1999, however, SIDS rates fell by more than 52 percent in the United States, and the number of SIDS deaths declined to 2,648 in 1999. In terms of the overall number of live births each year, SIDS is the leading cause of death in the United States among infants between one month and one year of age. For all infants less than one year of age, SIDS is the third-leading cause of death, following only congenital anomalies and short gestation/low birthweight. Researchers have drawn attention to other aspects of the incidence of SIDS deaths, but those variables have not yet been sufficient to establish differential diagnoses, screening procedures, or preventive measures for SIDS. In fact, SIDS is a sudden and silent killer, often associated with sleep, but apparently involving no suffering. Characteristically, SIDS deaths show a pronounced peak during the colder months of the year: January through March in the United States or six months later in the southern hemisphere. Epidemiological studies suggest that SIDS is somehow associated with a detrimental prenatal environment, but infants who are at risk for SIDS cannot be distinguished from those who are at risk for many other health problems. In general, at-risk infants include those with low birthweight or low weight gain and those whose mothers are less than twenty years of age, were anemic, had poor prenatal care, smoked cigarettes or used illegal drugs during pregnancy, and had a history of sexually transmitted disease or urinary tract infection. But none of these factors is sufficient in predicting how, when, why, or if SIDS will occur. In terms of social, racial, or other categories, SIDS appears in families from all social groups. Approximately 60 percent of all SIDS deaths are those of male infants. The largest number of SIDS deaths (approximately 70%) occurs in infants between two and four months of age, with most SIDS deaths (approximately 90%) taking place by six months of age. The "Back to Sleep Campaign"
In the early 1990s research suggested that infants might be at less risk for SIDS if they were laid to sleep on their backs (supine) or sides rather than on their stomachs (prone). That idea ran contrary to familiar advice that favored infants sleeping prone in order to reduce the risk that they might regurgitate or spit up fluids, aspirate them into their airway, and suffocate. Some health care professionals and family members still seem to believe that prone sleeping is best for an infant, but the new research suggested that infants who sleep on their stomachs are at far greater risk of SIDS than they are of other problems. 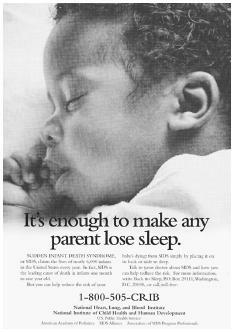 Accordingly, in April 1992, the American Academy of Pediatrics (AAP) Task Force on Infant Sleep Position concluded it was likely that infants who sleep on their backs and sides are at least risk for SIDS when all other circumstances are favorable (e.g., when sleeping on a firm mattress without overheating, loose bed covers, or soft toys nearby). As a result, the AAP recommended that "healthy infants, when being put down for sleep, be positioned on their side or back." In June 1994 a national "Back to Sleep Campaign" was initiated in the United States. A joint effort of the U.S. Public Health Service, the AAP, the SIDS Alliance, and the Association of SIDS and Infant Mortality Programs, the campaign seeks to employ literature, the media, and other avenues to raise professional and public awareness about the importance of sleep positioning as a way to reduce SIDS. SIDS Resources, Inc., in Missouri, provided one local example of how this campaign can be implemented in a simple but effective way by developing and distributing to new mothers tiny T-shirts for infants with the legend on the front of their shirt, "THIS SIDE UP . . . while sleeping." Subsequently, the AAP revised and strengthened its recommendation by emphasizing that positioning infants on their backs is the preferred position for their sleep at night and during naps. The AAP acknowledged that it is acceptable to allow infants to sleep on their sides because that is significantly better for them than sleeping on their stomachs, but side sleeping without proper support is a less stable position for an infant and thus not as desirable as back sleeping. Dramatic and sustained reductions in SIDS deaths in the United States and many other countries are associated with initiatives like the "Back to Sleep Campaign." Unfortunately, they have not applied equally to all racial and cultural groups in America. For example, it has been noted that African-American mothers are "still significantly more likely to place their infants prone" (Willinger, et al. 1998, p. 332). This reluctance to place infants on their backs for sleep appears to be directly correlated with less significant declines in SIDS death rates among African-American infants than among infants in other groups in American society. Research on SIDS is extraordinarily difficult, facing many problems that have long frustrated scientific investigators. For example, in SIDS there are no living patients to study because the first symptom of SIDS is a dead baby. In addition, risk factors for SIDS are not strong or specific enough to permit identification of high-risk groups as subsets of the general infant population in which the natural history of a disease can be followed with smaller numbers of subjects. And there are no naturally occurring animal models for SIDS. As a result, SIDS is currently unpredictable and unpreventable, although it is possible to modify some risk factors for SIDS deaths. This poster informs the public about SIDS, the leading cause of death in the United States for infants between one month and one year of age, and offers information on its prevention. that make them especially vulnerable to stresses that occur in the normal developmental life of an infant, including both internal and external influences. The leading hypothesis for study is delayed development of arousal, cardiorespiratory control, or cardiovascular control. Meanwhile, research based on epidemiology and pathology has dispelled numerous misleading and harmful myths about SIDS (e.g., it is not contagious and does not run in families) and has also ruled out many factors that have been thought at various times to be the causes of SIDS. For instance, it is known that SIDS is not the result of child abuse. Likewise, SIDS is not caused by vomiting and choking, minor illnesses such as colds or infections, or immunizations such as those involved in DPT (diphtheria, pertussis, and tetanus) vaccines. Nor is SIDS the cause of every sudden infant death. Any sudden, unexpected death threatens one's sense of safety and security because it forces one to confront one's own mortality. This is particularly true in an infant death because the death of a very young child seems an especially cruel disruption of the natural order: It seems inconceivable to most people, especially to new parents, that children should suddenly die for no apparent reason. The lack of a discernible cause, the suddenness of the tragedy, and the involvement of the legal system also help to make a SIDS death especially difficult for all those it touches, leaving a great sense of loss and a need for understanding. As a result, in addition to tasks that all bereaved persons face in coping with grievous personal loss, those who have lost a child to SIDS face additional challenges. No postdeath intervention can be expected simply to dismiss such difficult challenges. However, classification of an infant's death as an instance of SIDS—naming it as an occurrence of a recognizable syndrome—may help provide some partial framework for understanding. This diagnosis can also go a long way toward easing the unwarranted guilt of survivors who might mistakenly imagine that they had somehow contributed to the death or that they could have done something to prevent it. SIDS survivors, especially parents and grandparents, are likely to require much information about the syndrome and extended support in their bereavement. Contact with others who have experienced a similar death may be particularly useful. Explaining the death to a surviving child or subsequent sibling will demand empathy and skill. There is a great need at many levels in society for SIDS education and support. First responders (i.e., emergency medical personnel, dispatchers, police officers, and firefighters), day-care providers, funeral directors, and the clergy need to understand the differences between their clinical, legal, and human tasks. They must also recognize the different priorities that pertain to preventive tasks on the one hand and to emergency or follow-up tasks on the other. Counselors of all kinds must appreciate that those who are bereaved by SIDS are likely to have distinctive needs for information both about SIDS and about their own grief reactions and coping processes. For example, counselors will want to know how to validate the experiences of SIDS survivors, enable them to obtain access to medical resources, and introduce them to other SIDS survivors. Further, counselors will want to help those affected by SIDS to be patient with others experiencing their own unique bereavement from the same loss, and to assist them in moving on. Adult survivors may need help in explaining SIDS losses and grief reactions to siblings and other children, and in addressing questions related to a possible subsequent pregnancy. SIDS support groups and bereavement-support groups in other settings (e.g., a church or hospice program) may need guidance in meeting the special needs of those touched by SIDS. American Academy of Pediatrics. Committee on Child Abuse and Neglect. "Distinguishing Sudden Infant Death Syndrome from Child Abuse Fatalities." Pediatrics 107 (2001):437–441. American Academy of Pediatrics. Task Force on Infant Sleep Position and Sudden Infant Death Syndrome. "Changing Concepts of Sudden Infant Death Syndrome: Implications of Infant Sleeping Environment and Sleep Position." Pediatrics 105 (2000):650–656. American Academy of Pediatrics. Task Force on Infant Positioning and SIDS. "Positioning and Sudden Infant Death Syndrome (SIDS): Update." Pediatrics 98 (1996):1216–1218. American Academy of Pediatrics. Task Force on Infant Positioning and SIDS. "Positioning and SIDS." Pediatrics 89 (1992):1120–1126. Carolan, Patrick L., and Kathleen L. Fernbach. "SIDS and Infant Sleep Positioning: What We Know, What Parents Need to Know." Topics in Pediatrics 12, no. 3 (1994):15–17. Corr, Charles A., Helen Fuller, Carol A. Barnickol, and Donna M. Corr, eds. Sudden Infant Death Syndrome: Who Can Help and How. New York: Springer, 1991. Dwyer, Terence, Anne-Louis Ponsonby, Leigh Blizzard, et al. "The Contribution of Changes in the Prevalence of Prone Sleeping Position to the Decline in Sudden Infant Death Syndrome in Tasmania." Journal of the American Medical Association 273 (1995):783–789. Fuller, Helen, Carol A. Barnickol, and Teresa R. Mullins. "Guidelines for Counseling." In Charles A. Corr, Helen Fuller, Carol A. Barnickol, and Donna M. Corr, eds., Sudden Infant Death Syndrome: Who Can Help and How. New York: Springer, 1991. Guist, Connie, and Judy E. Larsen. "Guidelines for Emergency Responders." In Charles A. Corr, Helen Fuller, Carol A. Barnickol, and Donna M. Corr, eds. Sudden Infant Death Syndrome: Who Can Help and How. New York: Springer, 1991. Hillman, Laura S. "Theories and Research." In Charles A. Corr, Helen Fuller, Carol A. Barnickol, and Donna M. Corr, eds. Sudden Infant Death Syndrome: Who Can Help and How. New York: Springer, 1991. Hoyert, Donna L., Elizabeth Arias, Betty L. Smith, et al. "Deaths: Final Data for 1999." National Vital Statistics Reports 49(8). Hyattsville, MD: National Center for Health Statistics, 2001. Willinger, Marian. "Sleep Position and Sudden Infant Death Syndrome." Journal of the American Medical Association 273 (1995):818–819. Willinger, Marian, Howard J. Hoffman, Kuo-Tsung Wu, et al. "Factors Associated with the Transition to Non-prone Sleep Positions of Infants in the United States: The National Infant Sleep Position Study." Journal of the American Medical Association 280 (1998):329–335. Willinger, Marian, L. Stanley James, and Charlotte Catz. "Defining the Sudden Infant Death Syndrome (SIDS): Deliberations of an Expert Panel Convened by the National Institute of Child Health and Human Development." Pediatric Pathology 11 (1991):677–684.